The women of Bengal are very well known for their shiny black lustrous hair and beautiful eloquent eyes. The Bengali brides look more charming in a unique style draped saree and decorated with artistically lovely ornaments. Wearing ornaments includes the shakha-paula ceremony ,in which the bride has to wear one pair of red and white bangles. 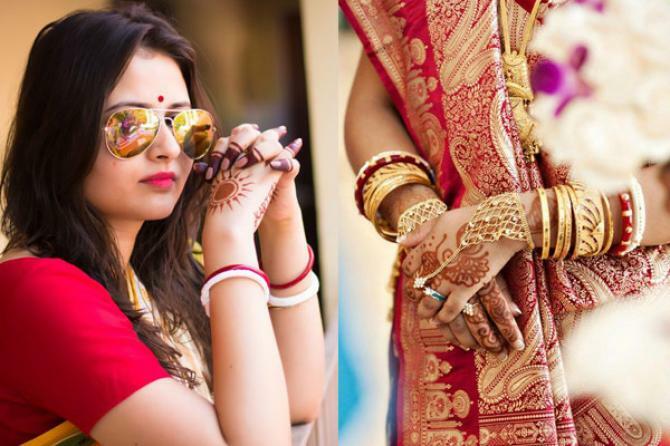 Red is the most loved colour by the Bengali Brides and it is also wore by them on every auspicious occasion (like the Bengali women wear red and white saree on the occasion of Durga Puja ). The banarasi silk in widely used and is common and most popular. The Bengali bride usually prefers to wear a bright red silk saree with gold zari,or buta work,or kantha work on it, handcrafted with ancient prints and designs. Before the wedding,the Bengali bride to be is smeared with a paste of oil and haldi so that her skin will glow and she would look more charming and beautiful on her wedding. Applying alta is a must for Bengali brides. Her hands and feet are beautifully decorated with alta with a special design. Her forehead is adorned with a huge red bindi accompanied by white and red dots on both sides decorated in any design that the bride likes. 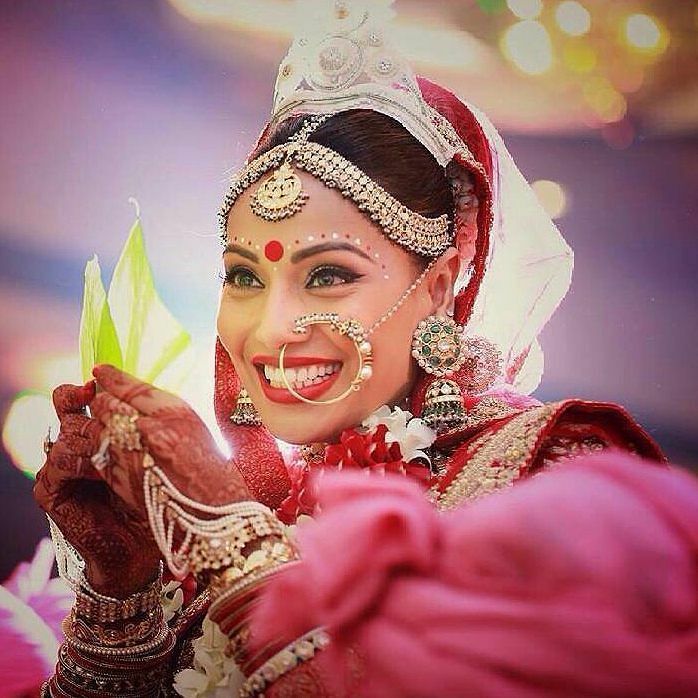 The nose ring is an integral part of Bengali wedding jewellery. In fact it is believed that bigger the “nath”, higher is the status of the bride. Nath or nose ring is very important part of bengali bride jewellery. There are two type of Naths- with chain or without chain. If a bride dont have nose piercing, one can also choose clip on nose ring or nath. It is a necklace worn on auspicious occasions like Durga Puja and wedding. Their designs are normally very intricate and complicated. 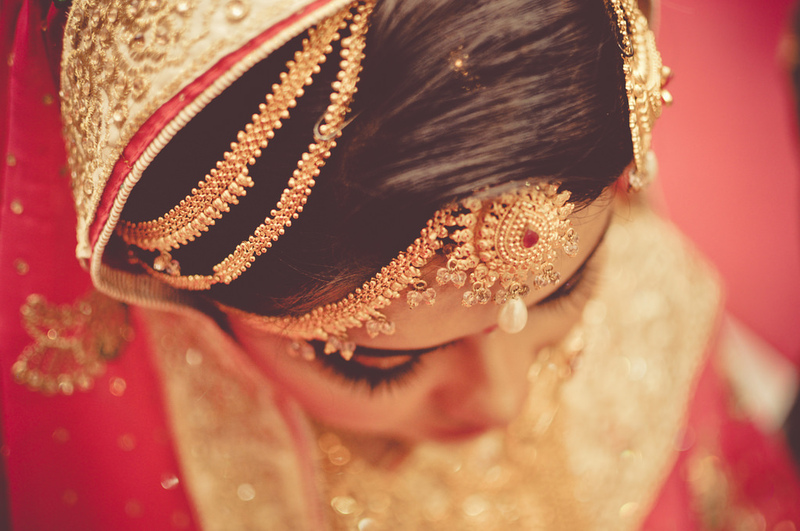 Paati haar is one of the amazing wedding jewellery wore by bengali bride. You can choose from a wide range of paati haar(necklace). Full gold, dimaond stubbed are most famous ones. This jewellery is worn by the Bengali bride in the middle parting of their hair. It is made of gold with precious stones studded in it. This magnificent Bengali jewellery is worn to hold the veils of a Bengali Bride. These are traditional gold bracelets worn by the Bengali bride .They have very intricate designs carved on them. 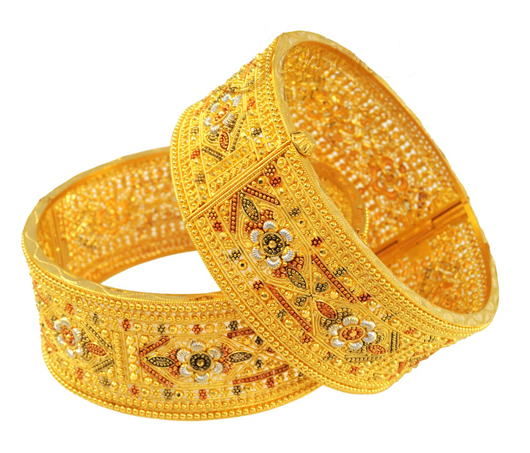 In Bengal the traditional gold bracelets are called “chur”. The ‘Ratanchur’ jewellery is meant to be worn on the hands. In this traditional Bengali jewellery, the five finger rings are attached to the wrist through individual chains. Common designs that have been used in making ‘ratanchur’ are the Sun, Moon and Lotus.